Location, location……..Shellsborough Penthouse (formerly Shellsborough View) is a super 2-bedroom seafront apartment in a large detached property on Woolacombes renowned Esplanade. 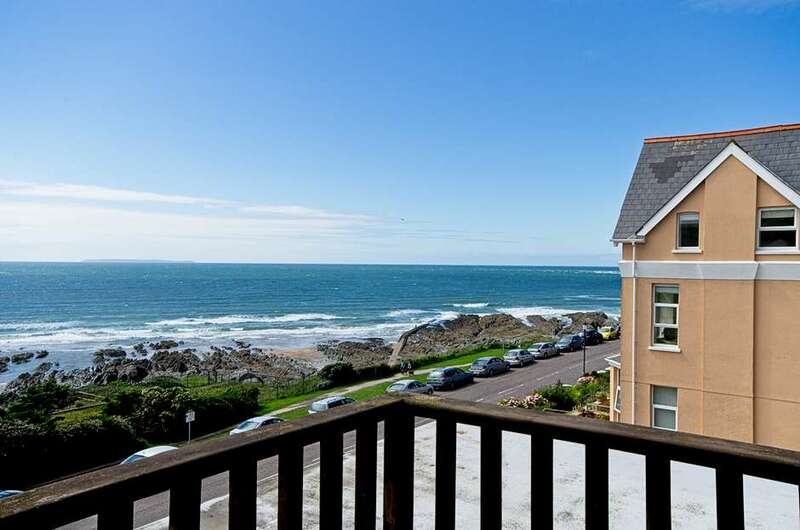 With private off-road parking for up to 2 cars, a sea view balcony, great Wi-Fi, master double and twin room both en-suite and just over the road from Woolacombe Beach, this great apartment ticks every box. Entrance is at car park level and then up a flight of internal stairs into the apartment which is carpeted and freshly painted. The living room has a brown leather comfortable suite of sofa and 2 armchairs and TV/DVD/iPod dock. The balcony has views to the sea and is a great spot to catch morning sun and evening sunsets. The dining table seats up to 6. This apartment has good Wi-Fi. The master double has a skylight Velux style window, clothes storage and a full en-suite of corner bath with shower over, sink and WC. The delightful twin bedroom has a seafront window positioned in the centre of the eaves with the full view over the beach and sea of Woolacombe Bay, a sink, storage and a shower, WC en-suite. There is a single fold-up guest bed for use by a 5th person if necessary. There is room for it in either room. The small galley kitchen is compact, but it has one of the loveliest views over to Woolacombe Down and Potters Hill so washing up will be a joy!! There is a slim-line dishwasher, under-worktop fridge with a freezer compartment, electric oven and hob and microwave. The washing machine and separate dryer are in a recess of the landing. All new mattresses in the last year. All in all, the best located and comfortable family holiday apartment right by the sea in this lovely village. You simply can’t go wrong.